By Louise F. Frellsen and Sepehr Ahmadi (Department of Physics, Technical University of Denmark, 2800 Kongens Lyngby, Denmark). Nitrogen-Vacancy (NV) centres in diamonds have quantum properties that allow them to sense weak magnetic fields. This is relevant both for research and health care as diamond magnetometers have the potential of being both cheaper and less inva- sive than current methods. The measurements are usually done by giving the NV centres energy from green laser light and detecting red light that they then emit. In this paper, we give an introduction to that technique before explaining a new measurement method where we do not need to measure any red light but can just look at how much of the green laser light that the diamond absorbs . Magnetic fields are all around us. They are like light, sound, or the microwaves that allow for wireless internet. We cannot see or hear the magnetic fields, but we can build systems that allow us to detect them. A well-known example is a compass that reveals the magnetic field of the Earth. When an electrical current moves it generates a magnetic field around it. This also happens in the body when the brain talks to everything else via tiny electrical signals running through nerves . This means that being able to detect magnetic fields can help us understand biology better as well as lead to better diagnosis of known diseases. The challenge is that these magnetic fields are very faint. A signal in the brain, for example, is ten billion times smaller than the field of the Earth [2,3]. So, a normal compass will not do. Instead, we turn to quantum technologies to be able to measure such fields. When the goal is sensing, the interesting thing about quantum systems is that the energies that the system can have are restricted. It has to be some fixed level. Thinking of it in everyday terms: It is like the volume on your phone. You can increase it in predefined steps but simply cannot put it in between those. Quantum systems are very sensitive so even small changes in the environment will affect which energy level the system is in. The Nitrogen-Vacancy (NV) centre in diamond is useful for magnetic sensing because of which energies the system is allowed to take. Figure 1. (a) Illustration of the diamond lattice consisting of carbon atoms (black balls). The grey sticks show the energy bindings to neighbours. The grey box is the smallest part of the lattice that does not repeat itself. (b) A diamond lattice with a Nitrogen (blue ball) – Vacancy centre. The combined NV centre system is marked with an orange ring. Pure diamond consists of carbon atoms locked into a lattice, as shown in figure 1. Some diamonds have colour and in those the colour comes from impurities – that is some other material than carbon sitting in lattice. The quantum system that we use to measure magnetic fields is an impurity with a Nitrogen atom next to where a carbon atom is missing and there is an extra electron . This is shown in figure 1(b). As a rule of thumb, systems in nature try to stay in the lowest energy level, if nothing is supplying them with energy from the outside. In figure 2, you find a diagram of the energy level structure of the NV centre. In the figure, we also see the effect of shining green laser light on the diamond. We start with the simplest case, where we have nothing affecting the NV centre in the diamond; this is shown in figure 2(a). The line at the bottom shows the lowest energy that the system can have. This is the state that the system likes the best. Down here the system can be in one of three quantum mechanical states. These quantum states are abstract and difficult to illustrate. For this article, we can think of them as just other energy levels that have only tiny differences in energy. To tell them apart we give them different names, let us call them a, b, and c.
Figure 2 (a) Energy level structure when nothing from the outside is affecting the NV centre. The higher up a line is the more energy it has. The electron, which defines the system (blue dot), is in the lowest energy level where it can be in either of the three quantum states a, b, or c. (b) Shining green laser light on the diamond can get the system up into one of the many high energy levels. (c) The system quickly loses a bit of energy and falls down into the separate high energy level. Here the system is in quantum state A, B, or C. Over time the system will fall back down to the lowest energy level, it can do so in two different ways. (d) The system can get to the lowest energy level by falling down directly. In this case, it emits red light. (e) The system can go down taking a detour through the shelf level. In this case, the system emits no red light. Although the system prefers to be down at the bottom it can be pushed up to a level with higher energy if we supply it some from the outside. This can be done by shooting it with a green laser. The green laser has so much energy that it does not just go to the second energy level, it goes up really high as shown in figure 2(b). In figure 2(c), we see that the system quickly falls down to a separate high energy level. This energy level is the same as the lowest one in regards to quantum states – so we call it A, B, and C.
As the system wants to have the lowest energy possible, it will fall back down to a/b/c over time. It can go by two different routes: It can go directly as shown in figure 2(d), this is fast and it makes the system emit red light. 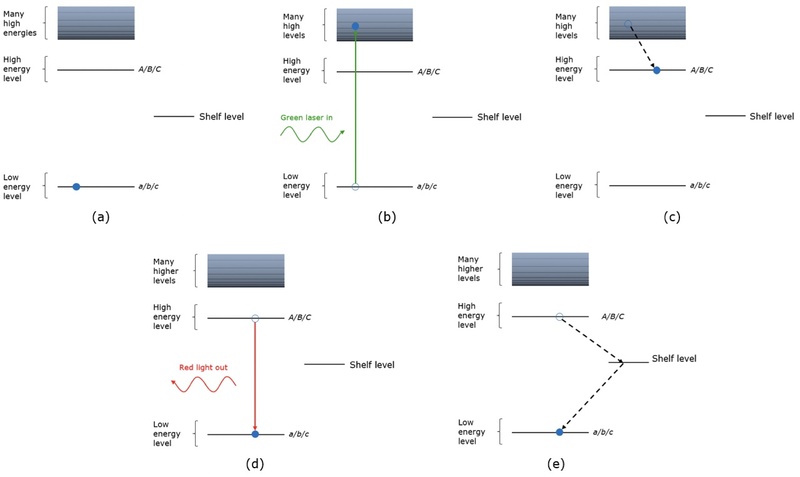 Alternatively, the system can go down to the low energy through a slower route by visiting the shelf level as shown in figure 2(e). If it takes the long way around, it emits no red light. What was just described is how the energy system looks if we have only the diamond and NV centres. To measure magnetic fields we need something more: we need to apply microwaves. Just like the light, the microwaves have energy, but they have much less. They cannot get the electron to go from a/b/c at the bottom to A/B/C at the top. Instead, it can change if the system is in a, b ̧or c while still staying down at the low energy level. Figure 3. Detailed energy level structure of the lowest energy level of the NV centre. The quantum states a and b/c are actually split by a tiny amount of energy. (a) When applying exactly the right amount of microwave energy it is possible to control the quantum state of the system. When it is in a red light is emitted. When it is in b/c no red light is emitted. (b) The energy structure of the ground state when a magnet is nearby. The magnetic field splits up the b and c states so that all three parts are separate. b and c can be chosen by different amounts of microwave energy and neither of them emit red light. To understand this better we look closer at the low energy quantum states. In figure 3(a) we see that a has a lower energy than b and c do. The difference is just tiny compared to the one between for example a and A. By applying microwaves with just the right energy we can choose if the system is in state a or b/c. We can also still use laser light to increase the energy of the system. If we have the green light and the wrong amount of microwave energy (either too little or too much because remember with quantum levels there is no in between), the system will go between a and A via the direct route shown in figure 2(d) which means that it emits red light. If we have both green light and microwaves with the right energy, then the system will instead go from b/c to B/C and now it passes by the shelf, as shown in figure 2(e) so it is slower and we get no light out. This means that by looking at how much red light the diamond emits we know which quantum state it was in! Now we are getting close to understanding how to measure the magnetic fields. The core of the matter is that a magnet will also affect the quantum states. So by bringing a magnet close to the diamond we can split up the b and c levels too . When they are split, it means that we need a different amount of microwave energy to reach each of those levels as shown in figure 3(b). Figure 4. The amount of red light emitted from the diamond depending on both the applied microwave field and magnetic fields. 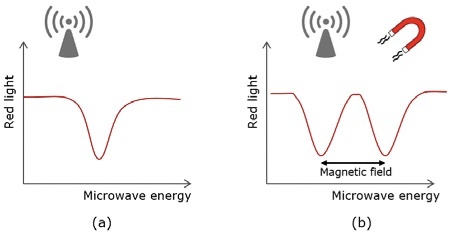 (a) When only microwaves are applied, we see one drop in the red light emission. It occurs when we have the right amount of energy to switch states from a to b/c. (b) When both the micro- waves and the magnet are present, we get two dips in the red emission; the first appearing when the system is in state b and the second when it is in stat c. How far the dips are apart depends on the size of the magnetic field. When measuring on NV centres in diamond you sweep through the energy of the microwaves while keeping an eye on how much red light you get out . When you have just the right amount of energy, you will change which state the system is in, and you will see a drop in the amount of red light as shown in figure 4. 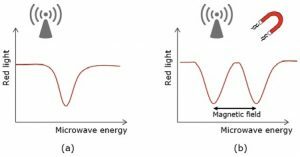 When a magnet is present, we get two distinct drops in the intensity of the red light because we have both levels b and c that emit less. The stronger the magnetic field is, the further apart the levels b and c are which means that the two dips move further apart. By seeing how far they are from each other, we can tell how big a magnetic field the diamond senses! Now we can introduce an alternative method building on the same principle. Here we do not look at how much red light comes out of the diamond but how much green light disappears. The green light can only be absorbed when the system is down in the levels a/b/c. Once it already has energy and is up in A/B/C or on the shelf, it cannot absorb more green light until it has fallen back down. Remember that it takes the system longer to go back down when it takes the long route through the shelf . This means that there will be a longer time where it cannot absorb the green light. The light just passes through instead. So, if we measure how much green light comes through the diamond, there will be more when the system goes through the shelf than when it takes the direct route. It takes the long route when in b/c, so we can get a graph sort of like the one shown in figure 4(b), but where we get peaks in green light, were we had dips in the red before. Just as before, we look at how far apart the peaks in the signal are to determine how big a magnetic field is present. Figure 5, Simple sketch of the experimental set-up. The diamond containing NV centres sits in a cavity between two mirors. A laser shines green light into the cavity where it bounces back and forth and passes through the diamond many times. On the other side of the cavity, a detector measures how much of the light the diamond absorbed. The method is advantageous because we get only very little red light out, while we have quite a lot of green. Light can get trapped inside the diamond because of reflections, but if we look at the difference between green light we put it and green light we get out that does not matter as the losses due to trapping will be a constant difference. The reason that this method has not been demonstrated before is that the ratio of green light in to green light out is tiny. We are capable of measuring it only because we have an experimental set-up including a cavity. The cavity consists of two mirrors placed on either side of the diamond, as shown in figure 5. The mirrors reflect the light back and forth such that it passes the diamond many times, which means that a bigger fraction has a chance of getting absorbed. The mirrors are designed to let a little bit of the light get out and that is where we have a detector monitoring the changes in the intensity. Figure 6. Measured intensity of the green laser light after it has passed the diamond. Here it is plotted as a function of the microwave frequency, which is proportional to its energy. The magnitude of the magnetic field can be determined based on the distance between pairs of peaks in the signal. Adapted from . Figure 6 shows a typical graph measured from the green light set-up. This signal follows the same principle as the example shown in figure 4(b) but it is slightly more complicated for two reasons. We work with a big diamond with many NV centres, giving us even more peaks. The peaks do however always come in pairs, so even though the data looks more complicated, the principle is the same: we can see how big the magnetic field is in a specific direction by looking at how far apart a pair of peaks in the signal level is. With our measurements, it was shown for the first time that it is possible to record magnetic fields with NV centres using only the green light. Working with and improving on diamond-based magnetometers is exciting and important because it can play a large role in both research and health care. There is much we do not know about the world of magnetism, simply because we have not been able to measure the fields. This includes understanding how birds and insects navigate or how our brains work. NV centres in diamonds are especially good tools for this, because the diamonds do not harm biological samples and the system operates at room temperature. This would make magnetic field sensors cheaper and more readily available in health care, where important scans of brain activity and nerve signals could help detect where a problem is so that patients can get the right treatment. Magnetic fields are continually around us in forms waves, we can not hear or see them but we use systems to detect them. A new idea is to use green light and diamonds to detect these fields. Diamonds consist of carbon atoms, and some have colour created by impurities (other materials that aren’t carbon in the structure). The systems we use to measure magnetic fields is an impurity with a nitrogen atom instead of a carbon one. 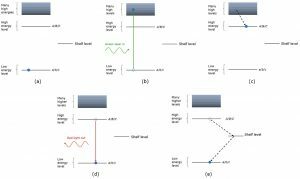 Changkyun Im and Jong-Mo Seo, A Review of Electrodes for the Electrical Brain Signal Recording, Biomed Eng Lett 6, 104-112 (2016), 10.1007/​s13534-016-0235-1. Hervé Gilles, Yves Monfort and Joseph Hamel, 3He maser for earth magnetic field measurement, Review of scientific Instruments 74,04515 (2003), 10.1063/​1.1605494. M. Kotani, K. Aihara, T. Numajiri, T. Takabe and Y. Uchikawa, Brain magnetic Field measurement and model Analysis, IEEE Translation Journal on magnetics in Japan 2, 9 (1987), 110.1109/​TJMJ.1987.4549632. F. Jelezko, C. Tietz, A. Gruber, et al., Spectroscopy of N-V centers in diamond, Single molecules 2, 4 (2001), 110.1002/​1438-5171. H. Hanzawa, H. Nishikori, Y. Nisida et al., Zeeman effect on the zero-phonon line of the NV center in synthetic diamond, Physica B 184 (1993), 10.1016/​0921-4526(93)90337-6. Eric van Oort and Max Glasbeek, Fluorescence detected level-anticrossing and spin coherence of a localized triplet state in diamond, Chemical Physics 152 (1991), 10.1016/​0301-0104(91)85011-5. Sepehr Ahmadi, Haitham A. R. El-Ella, Adam M. Wojciechowski, Tobias Gehring, Jørn B. Hansen, Alexander Huck, and Ulrik L. Andersen, Nitrogen- V acancy Ensemble Magnetometry Based on Pump Absorption, Phys. Rev. B 97, 024105 (2018) 10.1103/​PhysRevB.97.024105. 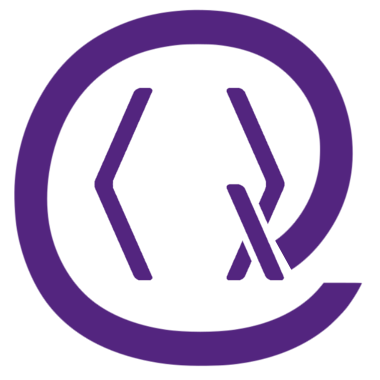 On Crossref's cited-by service no data on citing works was found (last attempt 2019-04-25 18:55:00). On SAO/NASA ADS no data on citing works was found (last attempt 2019-04-25 18:55:01).